El-Shahat reiterated his opinion regarding Nobel prize novelist Naguib Mahfouz in a TV interview on Thursday night, elaborating that Mahfouz’s novels “are mostly set in areas involving brothels and drugs.” He went on to describe Mahfouz’s acclaimed novel Awlad Harretna (Children of our Alley), one of the books that earned him a Nobel prize in 1988, as a novel whose “symbols promote atheism." El-Shahat’s statement propelled a reaction of alarm among Egypt’s liberals and intellectuals. Some considered the statement a reminder of the dangers that freedom of expression is likely to face in Egypt should the Islamists take power. Contemporary novelist and literature professor Sahar El-Mougy argued that it would be useless debating with El-Shahat and other ultra-Islamist figures over matters concerning arts and culture. It would overshadow, he says, the important questions they should be asked, instead, such as their economic and social plans for the country. 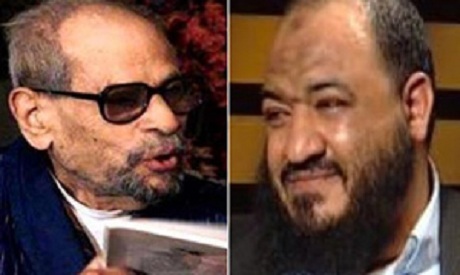 Author Ibrahim Abdel-Meguid, however, believes that the intellectual community is overreacting to El-Shahat’s statement. Abdel-Meguid says dismissively that Abdel-Meguid is “tuned into a time a thousand years ago,” and that he takes El-Shahat’s statements only with pity. Other statements by El-Shahat, the official spokesperson for the Salafist umbrella group, the Salafist Call, have sent just as many chills up the art community’s spine. For instance, he is notorious for his statement that Pharaonic monuments should be covered up because, according to El-Shahat, they are from a “rotten” culture that does not worship God. This also caused outrage among archaeologists as well as those who work in the tourism sector, who have further accused him of sabotaging one of Egypt’s main sources of revenue. El-Shahat also denounced those who promoted democracy, and not God's word represented by Sharia (Islamic Jurisprudence), as atheists. El-Shahat will be facing Hosni Mohamed Taha, who is supported by the Muslim Brotherhood, in a run-off election for a single-seat in Alexandria in the first phase of Egypt's parliamentary vote on Monday 5 December. There are only two things in this world 'medicine' doesn't help at all: Stupidity and ignorance. If these two things even get combined and come to power - then "Good night Egypt!" Not only I am saddened, but also I am very disappointed and angry of the fact that such an Egyptian like EL-Shahat doesn't know who he really is. The reason I said this is that he takes no pride whatsoever about his history and roots and what is means to be a proud Egyptian. The true Egyptians out there were involved during the revolution, for example whose during the 25th of January protected the Egyptian museum from looting in order to preserve their own cultures for the future generation and many others that I can go on and on about who are fighting towards a democratic and civil state. Hence, these people are the Egyptians who make me so proud. Whereas EL-Shahat's thinking is backwards and stupid as his party will use religion as an authoritative tool. This really puts great concern for the future of the country as it will most likely cause extreme turmoil for Egypt's future. This guy is so weird hes accusing all the people without any mercy instead of judging on people concentrate on your work! So this is what Egypt has come to. And it will go lower yet. Egypt is a laughing stock among nations. El-Shahaat's words only serve to prove that he is uneducated,ignorant and poorly read. In fact, I am pleased that a man of such low wit continues to comment in the same manner since it will dispel any notions that he or his Salafist party are to be taken seriously. Unfortunately the more stupid you are the more likely you are to get elected. does this man refuses the facts of life, the egyptian past or is he making fun of you all?